Brownback will not run for re-election. WASHINGTON (CNN) – Sen. Sam Brownback will announce Thursday he is retiring from the Senate when his term ends in 2010, allowing the Kansas Republican to explore a run for governor. He will be the second GOP senator this year to publicly state he is leaving at the close of the 111th Congress. Under Kansas law, by waiting until next month Brownback will not have to disclose how much money he has raised until early January 2010. Brownback, a prominent figure in conservative circles, is expected to tap into a national fundraising base established during his years in the Senate as well as his failed presidential bid. Brownback arrived in the Senate in 1996, winning a special election to fill the two remaining years of Senate Majority Leader Bob Dole’s term after the Kansas Republican resigned to focus on his presidential bid. 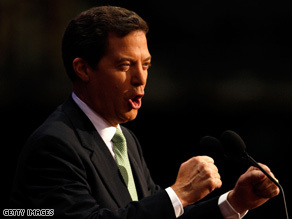 Brownback, who pledged in that campaign to only serve two terms, went on to win re-election in 1998 and 2004. Philip Blumel, president of U.S. Term Limits, will join Brownback at the news conferences to thank him for abiding by “his pledge not to serve a third term in the U.S. Senate,” according to a news release from that organization. Kansas Secretary of State Ron Thornburgh, a Republican, is currently raising money as he explores his own campaign for governor. Several candidates are considered likely Senate successors for Brownback, including Kansas Gov. Kathleen Sebelius, a Democrat, as well as two House Republicans, Reps. Jerry Moran and Todd Tiahrt. Brownback will join Florida Sen. Mel Martinez as the second Republican senator to announce his retirement following the 2008 elections. Texas Sen. Kay Bailey Hutchison is exploring her own 2010 gubernatorial bid; if she decides to run, it would create a third open Republican seat in 2010. Democrats, who gained at least eight Senate seats in the 2008 elections, only have to defend 15 seats in 2010, while Republicans have to protect 19. Democrats currently hold a 58 to 41 seat edge over Republicans in the chamber with the Minnesota contest between GOP Sen. Norm Coleman and Democratic challenger Al Franken still unresolved. Make way for another democrat! I bet he is running for governor of Kansas, when Sebelius is done. Sebelius 2010! I'm not from Kansas, so I could care less. I love you liberals! You make me laugh with all this stuff and you still have no idea what is going on. Elect Obama and he turns to the center (oh, what a surprise), and wait until his connection comes out to the gov. of Illinois. Obama is a very shallow man who has no values or ideas other than "yes I can" LOL What a laugh. Ride it while you people can ... it is going to be a WHOLE lot shorter than you imagine. I agree term limits for Senators is great. Brownback has done nothing during his tenure as senator except carry water for the evangelical right wing of the party. His message is primarily the demolition of the wall between church and state and he is a radical anti-abortionist, both ideas antethetical to the notion of religeous freedom in this country. Kansas is one of the few states that has Sunday Blue laws and he is completely supportive of those laws and more. I am certainly happy that he is leaving the senate. Maybe the people of kansas will do the right thing and return him to the position he deserves, that of private citizen. At least he is sticking by his words.Retirement,like the gop promises.Not like the dems renigging on there promises,especially Kennedy,and that old racist from WV. Robert Byrd.Oh I forgot there DEMS They can get away with everything. It amazes me to read the hatred expressed in these letters toward Sam Brownback and Christians in general. I personally know Sam Brownback, and he is a kind and caring man. For those of you who think this nation and our special form of government was founded on anything other than Christian principles, I recommend you embark upon a trustworthy study of Amercian history. You will find the founders understood the biblical role of government as an agent of God and tried to establish a consitutional framework based upon Christian principles. sea looks cold tonight doesn't it......"
Uncle Sam – Virginia. Great comment. I'm still laughing! My, there is certainly alot of hatred on this post. But what else would one expect from a bunch of whacked out leftists ? Ever notice how the people against evolution look really unevolved themselves? did he clear this with Rush first since Limbuagh is the voice of the Republican Party? He may not approve of this you know! One less crazy senator, too bad Kasnas always choses Republicans. Who supported the Agricultural bill and who didn't? Who is your friend and who isn't? You can call the RNC Chairman, Mike Duncan, by calling 202-863-8700 and voice your concerns directly about all the BS that his party is shoving down the throats of the American people! That is the number to his office, feel free to call as much as you want! It is one thing for Kansans to elect a Democrat governor and quite another to expect them to send one to Washington to support a national agenda they overwhelmingly reject. Sebelius profited from a split in the GOP. As long as she does not have a right wing extremist patsy to run against she will not be going to the Senate. Serious students of politics need only consider the 2008 ouster of Blue Dog Congresswoman Boyda in the Second District by moderate Republican Lynn Jenkins. And 2010 will not likely present the same favorable conditions of a Democratic tidal wave to support Sebelius. Frankly, she'd stand a better chance going back to Ohio where her daddy, John Gilligan, was governor and taking on George Voinovich if she wants to be a Senator. I am appalled by what CNN deems appropriate for posting. This dialogue regarding Sen. Brownback, one of the most honorable and respected men in the Senate, and regarded as such by those on both sides of the aisle, is extremely low and does not reflect well on CNN watchers or readers. Indeed many seem bigoted and anti-religious – obviously aimed at Brownback's evangelical, traditional Catholic faith.